Everyday qMobile bring new entry in Market which is very attractive and available in reasonable prices so Nowadays in Pakistan majority have using QMobile handset. 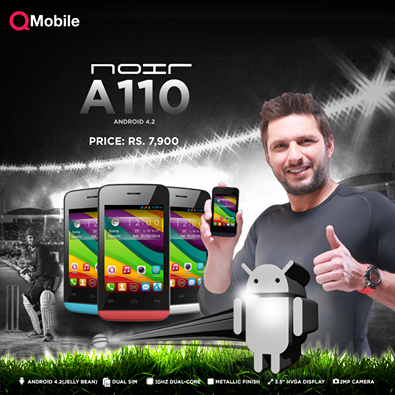 This time qMobile bring Noir A110 which is colorful and beautiful smartphone with all latest features like updated Android Version, Big Touch Screen, Dual SIM, Camera, Available in different colors Pine, Blue and White, Black. Android OS, version 4.2 Jelly bean, 3.5-inches with 800 x 480 pixels, HVGA Screen, 16 Millions colors, 1 GHZ Dual-Core with PowerVR G6200 GPU, 512 MB storage with 16 GB Card Support, 512 MB RAM, GPRS, EDGE, WLAN, Bluetooth, USB. 2 Mega-Pixel camera found on back with many features like Fixed focus, LED flash, Geo-tagging, HDR, burst mode and VGA Camera found on Front. 2G Network Only, SMS, Vibrations, Games, Speakers, Skype, What apps and Many more Features.